The Pyle Fold-Up Projector Display Screen is the perfect choice for a quick & easy viewing surface setup. 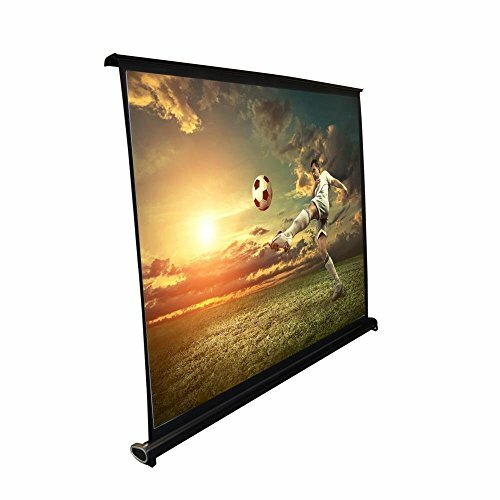 The lightweight and portable retractable design allow for a convenient projector screen wherever needed. Simply pull it up and lock it in place. The matte white viewing surface features an auto-locking mechanism that rolls out in seconds. The black masking border allows for optimum image focus and alignment. It's perfect for the home, office or classroom. Enjoy portable and hassle-free projector viewing with the Pyle Manual Projector Display Screen. HASSLE FREE SETUP: The digital projection screen is designed for simple setup and universal projection and portability. Perfect for the home, office or classroom. RUGGED DESIGN: The light projector screen is designed to be heavy duty and sturdy and is both stain and mildew resistant and made of flame retardant fabric. FIRST RATE VIEWING: The white projection screen is made of a premium matte fabric creating an optimal viewing surface. Also features a black masking border for increased image focus and alignment. VERSATILE SET UP: The video projector screen was designed to stand on any flat floor surface or table, creating a myriad of options for placement. Great for outdoor movies, indoor viewing parties, as well as presentations in the classroom and office.